Born at Argyle, Manitoba on 9 October 1906, son of Samuel James Fletcher and Jessie Ann McLeod, he graduated from the Faculty of Agriculture at the University of Manitoba with a BSA in 1932 and a Masters in Economics in 1935. From 1937 to 1945, he worked for the Dominion Livestock Branch at the Union Stockyards in Winnipeg. In 1945, he joined the Manitoba Department of Agriculture as the Agricultural Representative for the Shoal Lake district. In 1953, he was transferred to the Carman district where he served for eighteen years until his retirement in 1971. He was an early promoter of soil testing and the establishment of a soil testing laboratory. He assisted with the formation of the Carman and District Farm Business Association as well as the Manitoba Corn Growers Association, of which he acted as secretary even after retirement. He spent countless hours assisting members and leaders of the 4H program. 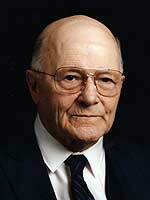 He was a charter member of the Manitoba Institute of Agrologists and was named a Life Member in 1972. In 1937, he married Iris Campbell and they had three daughters: Sheila, Marilynn and Lesley. Following retirement, he was elected to the Carman Town Council in 1973 and served as Mayor of Carman from 1974 to 1983. He was a driving force in the development of the Boyne River Diversion project. He served as the President of the Manitoba Association of Urban Municipalities from 1979 to 1980. He was also active in the Pembina Valley Development Association and the Lower Red River Valley Water Commission. He served as Chairman of the Shoal Lake School Board; a member of the Carman Chamber of Commerce, the Dufferin Historical Society, and the Masonic Lodge; and a Director of the Carman Hospital Board. For his leadership and volunteerism, in 1987 he was chosen as Carman’s Citizen of the Year. He died at Carman on 13 April 1995 and was buried in Greenwood Cemetery. In 2010, he was inducted posthumously into the Manitoba Agricultural Hall of Fame. Obituary, Winnipeg Free Press, 15 April 1995, page 44.